Stitcher's Lotion Try Me Tubes. Unscented Tester  - $4.00 : Yarn Tree, Your wholesale source for cross stitch supplies. Item 3329. Unscented Tester Stitcher's Lotion, 4 ounce Tube. Tester tubes not available to consumers. 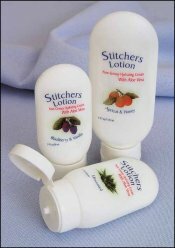 Luxuriously soothing lotion that is safe to use even while stitching. Won’t stain your fabric or threads. Easily washes out if any would happen to get onto your project. Available in five very light scents or unscented in 4 oz. tubes. Only for stores with a purchase of 6 or more tubes of an item number. Not for consumer purchase. From Fun Things! by Yarn Tree.